Last year's release of the Ryzen 7 1800X was truly a watershed moment for the PC industry. After multiple generations of stagnation with barely anything to offer in terms of competition against Intel, AMD has spent the last year releasing product after product at a staggering pace, and most of them have been extremely disruptive. On day one, AMD shot out of the gates with its octa-core Ryzen 7 series going up against Intel's quad-core Core i7 lineup, and one year later, here we are in a changed world. Intel has had to up its core counts for the first time in years to fight back, and so PC builders and buyers are enjoying a bit of a renaissance. AMD is now rolling out the first of its 2000-series Ryzen processors, and while these will be referred to as second-generation models, the changes are subtle. This is an optimisation cycle for AMD, not an all-new version of the underlying "Zen" architecture. There are four new models: the octa-core Ryzen 7 2700X and Ryzen 7 2700, and the six-core Ryzen 5 2600X and Ryzen 5 2600. 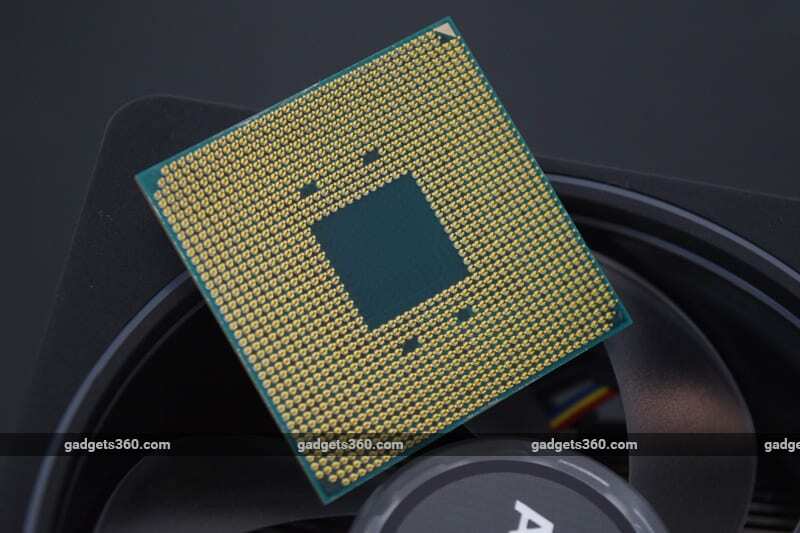 For some reason, these four are being branded as part of the same family as the Vega-infused Ryzen 5 2400G and Ryzen 3 2200G which were launched earlier this year and do not share the same architectural improvements. Today, we're testing the highest-end model, the new Ryzen 7 2700X, and there are quite a few interesting details to talk about. Here's our full review. One of the biggest changes that AMD has made is a move to a 12nm manufacturing process, down from 14nm. This actually gives it a lead over Intel, which has famously struggled with its own much-delayed move to 10nm for nearly two years now. This has allowed AMD extract higher clock speeds and efficiency from its architecture. The new Ryzen 7 2700X has a base speed of 3.7GHz and a boost speed of 4.3GHz (all-core boost is 4.2GHz), which is a considerable bump up from the Ryzen 7 1800X's 3.6GHz and 4GHz respectively. All Ryzen models have unlocked multipliers to allow for overclocking. However, there's a surprising jump in the TDP value from 95W to 105W, which makes us worry that this chip is more power-hungry. Inside the chip, there are still eight cores arranged in two quad-core clusters that AMD calls Core Complexes. You get 16 logical threads thanks to multi-threading support. There's 16MB of L3 cache memory, and each core has its own 512KB L2 cache. You can have up to 64GB of DDR4-2933 RAM (with two modules), up from DDR4-2667. AMD says that while the core architecture is largely unchanged with Zen+, it has been able to reduce cache and RAM latency by enough to effect a small improvement in performance per clock cycle. The other performance gains come from tweaks to the Precision Boost and eXtended Frequency Range (XFR) features that underpin the Zen architecture. Precision Boost 2 still allows the CPU to dynamically change its clock speed in 25MHz increments in response to workload conditions, but now it also allows for individual cores to be tweaked, rather than considering them in groups. Similarly, XFR, which allowed a few cores to be pushed above the rated boost speed, now applies to any number of cores - if you have a powerful enough heatsink and robust enough power supply. AMD says that it made these changes based on observations of how first-generation Ryzen processors were being used in the real world. In both cases, the company is addressing cores individually rather than in groups, because there were situations when the algorithms wouldn't let them scale to their full potential. The only limits now are your real-world operating conditions, so you should be able to have more cores running faster for longer stretches than before. Last year's top-end Ryzen models didn't come with a cooler in the box, but now AMD is including one with every model. The Ryzen 7 2700X gets the new top-end Wraith Prism LED cooler, which the company says is beefy enough to support overclocking and unleash the potential of XFR. AMD claims that this is a $50-60 value addition, and there's no doubt that it's nice to have. However, enthusiasts who want to use a liquid cooler or anything of their own choice would likely wish AMD had passed on the cost benefit to them instead. The Wraith Prism LED is quite wide and tall, almost bumping up against a module in the first RAM slot of our test bench's motherboard. It has a copper base and four direct-contact heatpipes. A switch on the housing itself lets you choose between quiet and oveclocking modes. Its most distinct feature, however, is RGB LED lighting. There's a ring of LEDs around the fan, plus more beneath the transparent blades. The AMD logo makes for a third independent lighting zone. Wires are included that let you plug the fan into your motherboard's LED headers or an internal USB header, letting you control everything in sync with your other hardware. It looks pretty impressive, and is a far cry from Intel's bare-basic stock coolers. The downside is that there's no easy way to route the wiring for the LEDs, making the build that you want to show off look a little messy. AMD has committed to a multi-year window of compatibility for the AM4 socket, so you can use any Ryzen 2000-series chip with any previous-generation motherboard, and vice versa. Confusingly, the X370 will live on along with the lower-end B350 and A320, creating an additional tier in the market. AMD insists that you won't lose any functionality or performance if you use a new CPU with an old motherboard, but there are some differences. Motherboards based on the X470 chipset are supposed to be optimised for more robust power delivery to the CPU for higher overclocks, and connectivity between the CPU and RAM slots is also supposed to be improved to support faster modules. What this has to do with the chipset itself is unclear, but at least the updated model number will make it easy to identify these second-generation motherboards in the market. There's another new feature that AMD is playing up, called StoreMI. Much like Intel's Optane Memory concept for ganging up a small SSD and large HDD to get the best of both worlds, StoreMI aims to merge the two and optimise your data so that your PC boots quickly and things you need often are on the faster physical medium. According to AMD, setting up StoreMI doesn't require formatting the drives or reinstalling Windows, and it can be turned off or on anytime. Earlier this year, AMD announced similar functionality on first-gen Ryzen motherboards through a partnership with an enterprise storage firm called Enmotus, using its Fuzedrive software. While Fuzedrive cost $20 (approximately Rs. 1,313), StoreMI is free for X470 motherboard owners. We aren't testing this functionality today because the final version of the software hasn't been released yet, but AMD says it's coming soon. 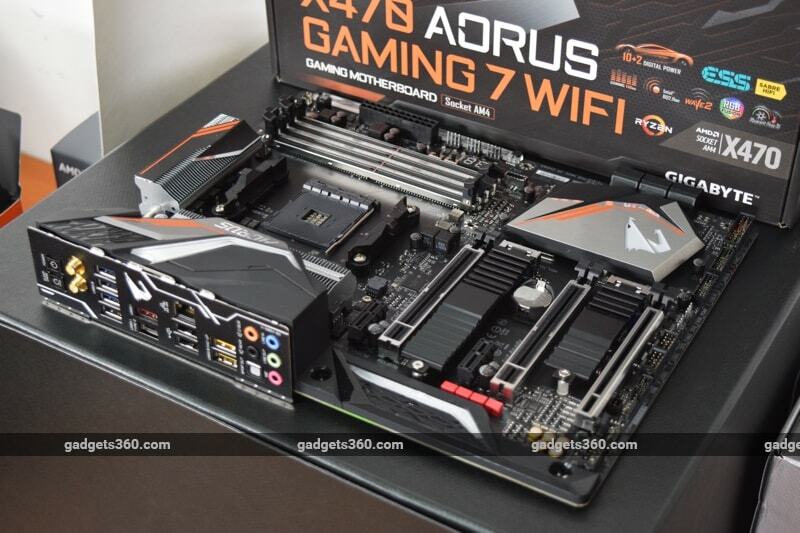 Our test bench for today is Gigabyte's top-end X470 offering, the Aorus X470 Gaming 7 Wifi. This is an extremely good-looking motherboard, with orange, silver and grey accents that are actually quite tasteful, and don't look too garish against the black PCB. It features RGB LED lighting (of course) which is a matching orange by default and also not too bright. The layout is pretty tight, but there are a lot of features. The heatsinks over the CPU power regulators look pretty chunky, and definitely not like they're there only for show, which fits with the X470's focus on power quality. Both M.2 slots also have heatsinks, but height clearance is a problem. We found that there was barely any space between the bottom of our graphics card and the second M.2 slot's heatsink, which is not great for airflow. There are three full-length, metal-shrouded PCIe slots, but only the first one is wired for the full 16 PCIe lanes, while the others are x8 and x4 respectively. There are also two more PCIe x1 slots. You get six internal SATA ports, and Gigabyte seems to have dumped the largely pointless SATA Express standard. We love to see built-in rear panel shrouds, which take half the hassle out of assembling a PC. Connectivity is decent, with one USB 3.1 Gen2 Type-C port, one USB 3.1 Gen2 Type-A port, six USB 3.1 Gen1 ports, two USB 2.0 ports, Gigabit Ethernet, five analogue audio jacks, an S/PDIF audio output, and two Wi-Fi antenna terminals. Note that there are no video outputs for an integrated GPU, so even though the X470 is compatible with AMD's APUs, you can't use them with this particular motherboard. It's clearly meant to be paired with high-performance Ryzen 7 CPUs, but defeats some of the promise of Socket AM4 interoperability. Gigabyte has gone with Intel for the Gigabit Ethernet and dual-band Wi-Fi 802.11ac controllers. You also get Bluetooth 5. The onboard audio codec is a Realtek ALC1220, and there's a Sabre ES9018Q2C DAC and headphone amplifier. There are six system fan headers plus independent fan and waterblock headers for the CPU socket. There are also two pairs of RGB LED headers to support RGB as well as UV lighting strips. One minor complaint is that the power and CMOS clear buttons are on the rear panel rather than the board itself, which doesn't make a lot of sense. The Gigabyte UEFI Bios isn't as well designed as what we've seen from other manufacturers. There's an Easy mode, which is like a dashboard overview for major parameters such as fan profiles and boot devices. There are some overclocking controls but they're somewhat buried in the menu structure. Gigabyte obviously isn't making a big deal about overclocking with this model. We liked the graph-style fan speed adjustment tools, and the fact that you can control all aspects of the LED lighting without additional Windows software. We would have liked some text explaining the more obscure options, but overall this is a simple, functional interface that you most likely won't have to deal with very often. 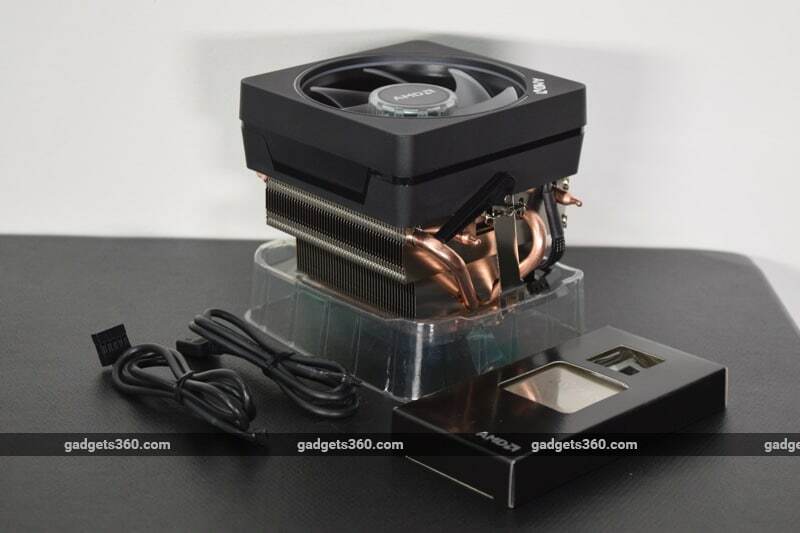 We should note that the Gigabyte Aorus X470 Gaming 7 Wifi and the dual-channel G.skill Sniper X DDR4-3400 RAM we used for testing were both provided by AMD for the purpose of this review. The rest of the components were selected to try to match the test environment that was used for our Ryzen 7 1800X last year. We used Windows 10 with all the latest updates installed, and pre-release drivers provided by AMD. We're comparing performance gains directly against the Ryzen 7 1800X, and we're using scores from our recent review of the Intel Core i7-8700K which AMD is positioning its new offering directly against. We've also got some test scores from Intel's 10-core Core i9-7900X for reference, because while it is in a whole different price class, it's interesting to see how close the new Ryzen can come to it. We pulled out the more relevant Ryzen 7 1800X to update its scores with our newer tests on it, but were unable to do so for the Intel CPUs due to logistical constraints. In cases where benchmarks have been updated significantly and comparisons would be misleading, we have chosen to omit scores for the Intel CPUs - however you can click through to the original reviews of each one to see their original scores. We started with the industry-standard Cinebench R15 and POVRay which stress the CPU to its limits, and worked our way through a long list of synthetic benchmarks including PCMark 10 and SiSoft SANDRA to measure overall system performance. We can see that the Ryzen 7 2700X shows significant and consistent gains over its predecessor - certainly not enough for first-gen Ryzen owners to rush out and upgrade, but still a solid improvement that keeps the momentum going. When it comes to the Intel Core i7-8700K, the two trade blows. Once again we see that Intel maintains a lead in single-threaded workloads, but AMD's octa-core approach still pays off, especially in content creation apps. Our real-world and gaming tests threw up a mixed bag of results. AMD promised to maintain its multi-threaded advantage while gaining on Intel's single-threaded performance with this generation, and we don't quite see things playing out that way. On average, things still lean in Intel's favour here, but it depends heavily on which programs are in use. One thing we do see is that there are specific situations in which Intel's enthusiast-class Core i9-7900X shines, but you could save a lot of money and not suffer too badly by choosing an octa-core Ryzen 7 2700X instead. When it comes to gaming specifically, something to consider is that while this is still the best example of how much single-threaded performance really matters, a lot of games today are not only taking advantage of multiple cores but are beginning to require them. If you're buying a PC now and expect to play newly released games for several years, you might find that a quad-core CPU is the minimum spec, with more cores recommended. We tried a little casual overclocking using the bundled Wraith Prism LED cooler and AMD's Ryzen Master utility for Windows. We weren't able to get very far though - our test system was unstable with the base clock speed set to anything above 4.2GHz. We were able to run Cinebench's multi-core test at this speed and our score rose to 1,929. Anything beyond that and our test bench froze mid-run. 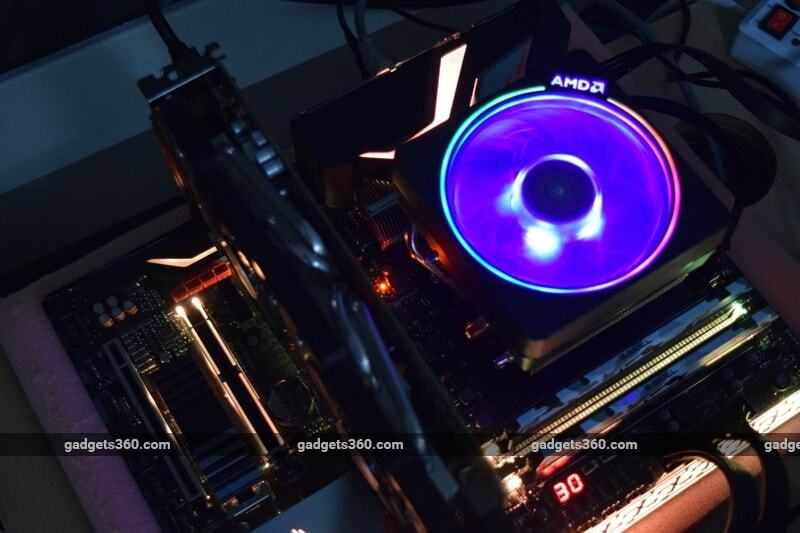 Finally, despite many of AMD's claims, we found the Wraith Prism LED to be relatively loud. There was a constant dull whirr even when our test bench was idling, and you can really hear it ramp up when the CPU is pushed. AMD blew us away last year, and of course we can't expect the same thing to happen again so soon. The Ryzen 7 2700X is a competent step forward, not a whole new generation of architectures. If you were planning to upgrade, AMD just made the deal a little sweeter - and yes, we do enjoy the fact that this keeps Intel on its toes. We're particularly impressed by AMD's value for money proposition. The Ryzen 7 2700X will cost approximately Rs. 29,500 after factoring in taxes, which is significantly lower than the Ryzen 7 1800X's launch price of Rs. 37,999. The cost is pretty much identical to that of Intel's Core i7-8700K but you also get the Wraith Prism LED cooler. It isn't perfect, but is a huge bonus for first-time builders. Over the past year, we've seen that Ryzen CPUs haven't been universally faster than Intel's equivalents, especially with single-threaded brute-force workloads such as gaming. However, modern PCs are subject to heavy multitasking and even many gamers want to stream simultaneously. With its balance of single- and multi-threaded performance, AMD's Ryzen could make a lot of sense when you consider how people use their PCs. Even being as attractive as it is, the Ryzen 7 2700X has challenges. Intel has responded with six-core models and is expected to keep ramping up aggressively, which could erase AMD's advantages. And while gamers might not think much of integrated graphics, you still get a fairly competent GPU built in to every Intel Core processor - and it can really come in handy sometimes. As for the Gigabyte Aorus X470 Gaming 7 Wifi, we found a few niggles in terms of layout and features, but performance was flawless. It looks great and is well suited to the specific purpose of being paired with a Ryzen 7 2700X. However, if you aren't interested in overclocking, you could save some money by choosing an X370 model, and there are plenty of those already in the market to choose from. 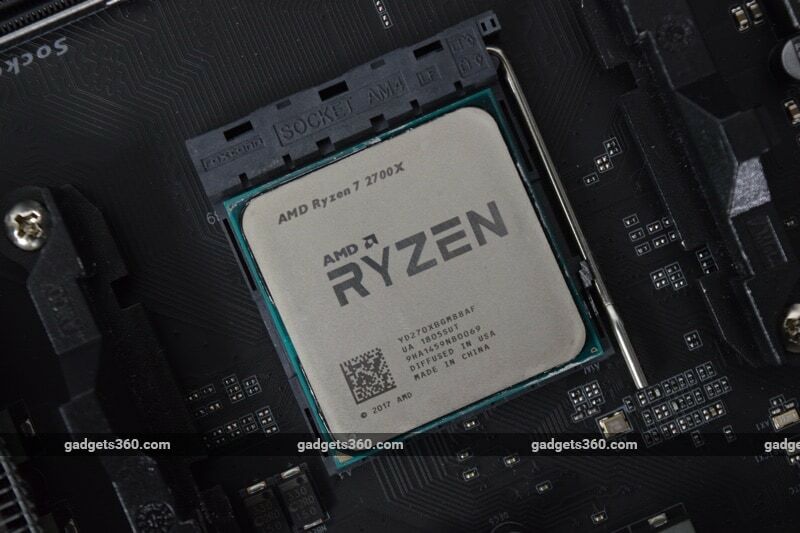 product We tested the second-generation Ryzen 2 2700X processor to see if AMD can impress us as much as it did last year with the original.